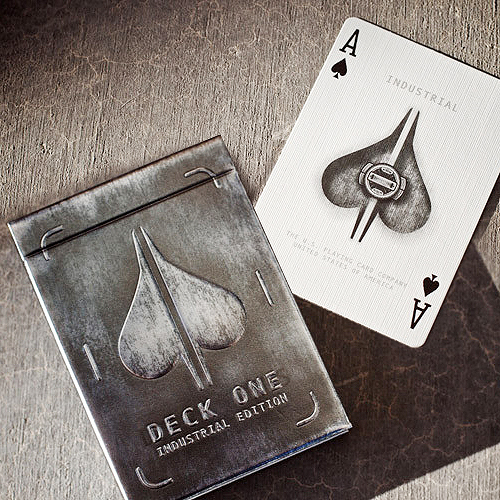 Deck One is unlike any deck of playing cards you have ever seen. The box radiates a metallic, gunmetal shine, and the result is love at first touch. Playing cards truly unlike anything you've seen before. The first edition sold out in record time. The latest edition is now available. While the deck remains the same as the first edition, the box was redesigned to perfectly showcase Homer's original artistic vision. In fact, the new distressed metallic box resembles the original box after being worn down over several weeks in a jacket pocket - we just wanted to save you the time! The box is made of paper 25% thicker than the Sentinel tuck case, and they are coated with a durable varnish. These cards protect themselves. DeckONE features original illustration by Homer Liwag proudly on the box, the back design, the Jokers, the Ace of Spades, and even each court card. The Kings, Queens, and Jacks exude a unique patina. DeckOne's industrial inspiration draws from over 30 years of television and movie production design, concept art, and illustration. While sketching Bat Mobiles and Colonial Viper space ships as a kid in the 70's, Homer dreamed of designing props and ships for TV shows and movies. "I wanted the back design to appear heavy - like the giant otherworldly machines they depicted. For the case, I created the look of worn, military grade, black stamped steel by using thick metallic stock and subtle printing and embossing effects." D1IE is the perfect union of Homer's formal training in Industrial Design and his passion for feature film conceptual art: simple, sleek, modern design. • The cards are poker size.